Hong Kong and now-Hollywood action comedy superstar Jackie Chan is back again in the 6th instalment of Police Story but just like the previous one (New Police Story in 2004), he does not reprise his role as Chan Ka Kui, the protagonist of the first Police Story to the fourth one, and instead, this so-called reboot is also a standalone film. Taking charge of direction and writing was Ding Sheng, who has worked with the “big brother” Chan before in the fun and meaningful period action comedy Little Big Soldier (2010). This is the first instalment in the franchise to be produced with China. Now let’s get that one thing out of the way first – this instalment is nothing like any of the previous Police Story films, and CZ12 (2012) is perhaps the last time we’ll see Jackie Chan doing all the crazy stunts and humourously choreographed fight sequences. Many people have been bitching everywhere on the internet saying that they’re disappointed that the movie is boring with very little action, no stunts, not much jokes, etc. What did you expect from a 59-year-old man? He probably wanted to experiment something different for a change. You want the old fellow to clown around and jump down from top floor of a mall holding onto strings of light bulbs? Come on. And about the title, yes, I did think that they’ve probably reused the popular franchise name just to attract moviegoers but after catching the movie, I couldn’t think of a more fitting title for the plot. If one can watch this film without expecting the usual Jackie Chan or Police Story elements, you might find it pretty decent. Now let’s talk about what it is and not what it’s expected to be. 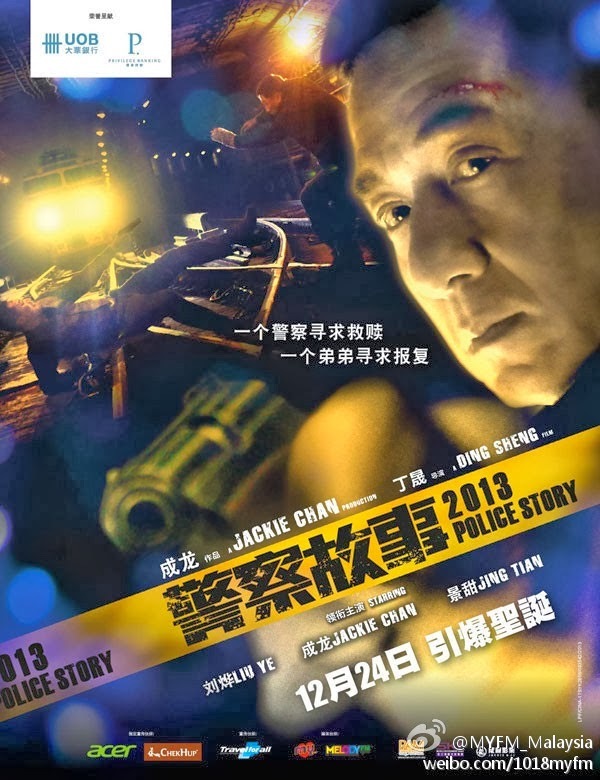 Police Story 2013 is darker and perhaps grittier than any of the previous instalments of the franchise and the plot, much to my surprise, is quite intriguing for a China production. I guess this is the advantage when they don’t try to imitate Hollywood and just stick with their expertise with dramas. Jackie Chan plays a kindhearted, dedicated low-rank Mainland policeman named Zhong Wen, who meets up with his rebellious daughter Miao Miao (Jing Tian) at a bar without realising that he’s walking into a serious trap masterminded by Wu Jiang (Liu Ye), a villain who demands to know “the truth” of an event that happened 5 years ago involving a few individuals, including Zhong Wen. “The truth” is slowly revealed bits by bits as the story progresses with a few fight scenes here and there but the real thrills comes from Zhong Wen’s negotiations and search of ways to get the hostages out safely, including his own daughter. After saying that, it kind of sounds like a crossover of V for Vendetta (2006), Die Hard (1988) and The Negotiator (1998). Chan’s old age plays a huge part of the protagonist, an emotionally demanding role that required Chan to act urgent, calm, sad, compassionate and tired at the same time, which I thought he nailed it very well. The performance of the others, however, aren’t as significantly impressive. 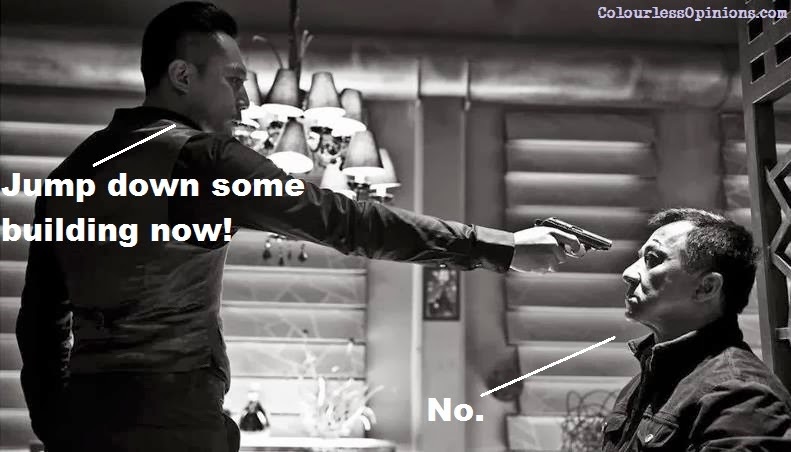 Probably it would’ve been more compelling if we get to watch it in Mandarin, its original dialect as the Cantonese voiceovers, except for Chan’s, makes almost every scene with dialogues sound utterly stupid, almost ruining the seriousness of the premise. Now I’m not so sure about the law in China, but wouldn’t it be easier for the villain Wu Jiang to learn about “the truth” directly from the police? Instead of masterminding the entire plot to capture everyone who was in the crime scene who’re supposedly responsible for his sister’s death 5 years ago, he could have just went straight to the police station and request for an investigation report. He would’ve at least known that she committed suicide as all witnesses’ statements would’ve been recorded by the police. Both Zhong Wen and one of the involved, Wei Xiaofu, have heard her say “please just kill me” twice before she uses Wei Xiaofu’s blade to slit her own throat. Also, Wu Jiang doesn’t seem like he doesn’t know that she was pregnant when this happened. He and his sister were practically family-less so the police would’ve either contacted him or her boyfriend, who’s actually one of the responsible individuals who caused her death (depends on how you look at it) and went missing after. It’s just stupid when it’s revealed in the end that the boyfriend is actually one of the Wu Jiang’s men all along pretending to be one of the hostages. Censorship in Malaysia: I watched it at a normal screening and didn’t notice any sequences cut. 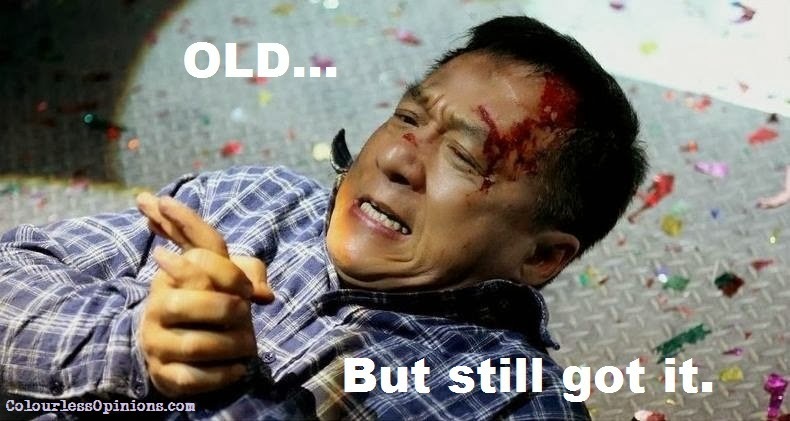 Second opinion: My girlfriend doesn’t seem to know that much about Jackie Chan’s previous Police Story movies but she agrees that the this instalment isn’t that bad, just that dialogues sound a bit dumb indeed. Verdict: Not your typical Jackie Chan film (again), but not as bad as typical moviegoers would tell you. Not for those who expects a lot of action. It’ll be much better to watch the version that’s not dubbed to Cantonese even if you can’t understand Mandarin. Synopsis: Night. Inside an enormous bar on a busy street, all the patrons are being held hostage. Among them are policeman Zhong Wen and his daughter Miao Miao, and several strangers who seem to have met before…. The kidnapper is the bar owner Wu Jiang. His only demand is the release of a long-term prisoner. What motive is worth this risk? The prisoner is brought to the scene of the crime, but the police now face an even greater crisis, as a cold case is re-opened. Cold is the mind of the policeman, decisively using his wits to resolve the crisis; his mission is to find – the truth. Cold is the blood of the criminal, calmly carrying out his evil plan for – his revenge. Cold are the hearts of uncaring people, reacquainted only to pay the ultimate price for their selfishness – their lives. Cold are the facts that prove to the rebellious Miao Miao through her extreme ordeal with her father – their love. This is a death-match to avenge a lost love.